New from one of Kaplan’s top LSAT instructors—focused strategies, all real LSAT questions, and targeted review to help students master the Logic Games section of the LSAT! Future law school students know that LSAT scores counts for 50 percent of their admissions package. With top law schools routinely accepting fewer than 15 percent of their applicants and competition for limited places at law schools increasing, students know how important it is to get the highest score possible on the LSAT. Kaplan LSAT Logic Games Strategies and Tactics is the new comprehensive study guide designed to prepare students for the Logic Games section of the LSAT, through thorough invaluable analysis and detailed practice with only real LSAT questions. Author Glen Stohr is one of Kaplan’s most sought-after LSAT instructors, with extensive experience in test preparation and pre-law education, and his students have achieved impressive 99th-percentile LSAT scores. 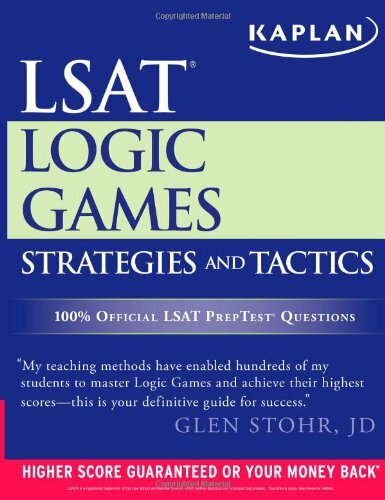 In Kaplan LSAT Logic Games Strategies and Tactics, Stohr clearly outlines the steps needed to approach the different types of logic game questions a test taker would encounter on the actual LSAT, and offers engaging and effective strategies to help students master the exam. Kaplan LSAT Logic Games Strategies and Tactics provides students with everything they need to improve their scores—guaranteed. Kaplan’s Higher Score guarantee provides security that no other test preparation guide on the market can match. Kaplan has helped more than three million students to prepare for standardized tests. We know that our test-taking techniques and strategies work and our materials are completely up-to-date. Kaplan LSAT Logic Games Strategies and Tactics is the must-have test preparation tool for every student looking to score higher! Glen Stohr, JD, has more than 15 years’ experience in test prep and pre-law education. He has taught more than 3,000 students. His students have achieved 99th percentile LSAT scores and gained admissions to Yale, Georgetown, University of California, Berkeley, and other leading law schools. He created Kaplan’s LSAT Advanced Course for high scorers and headed academic and curriculum development for Kaplan’s Summer Intensive Program, including teacher selection and training, student materials and communications, and on-site instruction. He has developed curriculum for print materials, live instructions, and for multi-media platforms. Kaplan is the #1 Choice for LSAT Prep! With more than 70 years of experience, Kaplan’s products and programs are designed with students in mind. Our unique combination of the highest quality study materials, realistic testing experience, and dynamic tutors is unrivaled. We provide the most personalized prep with more options than any competitor— including classroom courses, online programs, small group and one-on-one tutoring, and self-study guides. In fact, Kaplan’s prep is so focused and effective, Kaplan guarantees students’ scores will improve—or they get their money back.